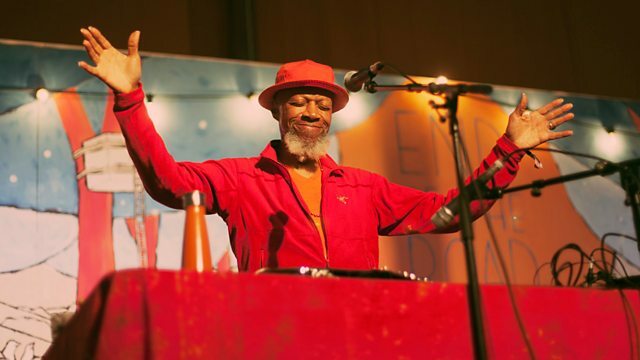 Nick Luscombe has highlights from new-age zither player Laraaji and London five piece Housewives' performances recorded on the Late Junction stage at End of the Road festival. On the first Friday of September the Late Junction team donned their wellies and headed into the English countryside to curate an evening of live music from End of the Road festival in Dorset. It is the first year the programme have teamed up with End of the Road who have established themselves as a haven for adventurous music lovers at the tail end of the festival season. Nick airs highlights from the stage all this week, starting with Laraaji's blend of transcendental jazz and new age ambience and progressing to the industrial drones and abrasive riffs of Housewives. Laraaji is a multi-instrumentalist, mystic and laughter meditation practitioner who began playing music on the streets in the 1970s, improvising trance-inducing pieces on a modified autoharp. He was spotted by Brian Eno who invited him to record an album for his seminal Ambient series in 1980, Since then Laraaji has gone on to release a series of new-age works of his own, featuring his trademark electrified zither alongside mbira and piano. As well as his live performance, we'll be dipping into Laraaji's laughter meditation workshop which he will be presenting on site. Since their formation in 2013, London-based five piece Housewives, featuring Joseph Rafferty on guitar and vocals, David Moran on guitar, Ben Vince on saxophone, Lawrence Dodd on bass and Alexander Evans on drums, have amassed a cult following for their brutalist lo-fi noise music. Their two albums to date draw inspiration from Italian noise pioneer and instrument builder Luigi Russolo, Steve Reich, the No Wave scene and Charles Hayward's This Heat. They have been championed by Hayward himself, who describes their sound as "a barely controlled anger, hypnotic and building from the simplest elements." Also on the programme we have a rarely heard piece for Japanese drums and orchestra by Maki Ishii and go-getting 80s library music from British composer Peter Morris. A quick laughter yoga workshop, led by legendary musician and laughing guru Laraaji. Highlights from End of the Road festival from Klein and Xylouris White. Recorded live on the Late Junction stage at End of the Road 2017. Sometimes I Wish We Were an Eagle. Nairobi Calling: Selected Recordings 1976-1996. Live on the Late Junction stage at End of the Road 2017.